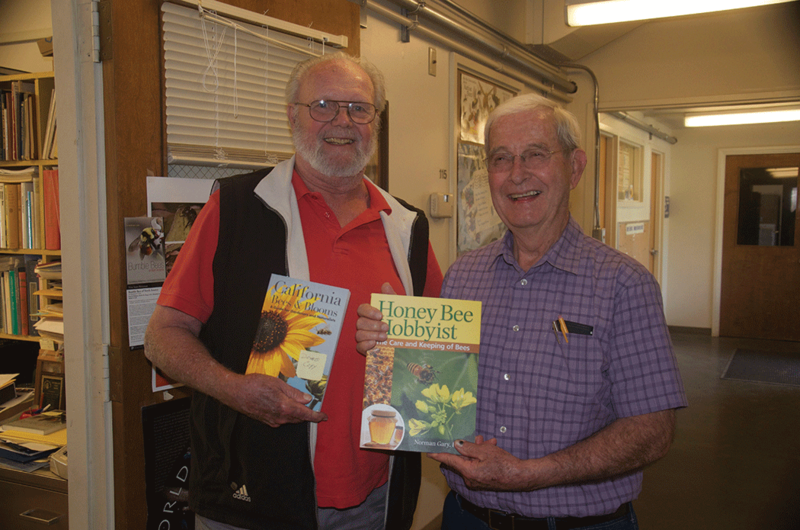 Two retired bee researchers and two new books. Robin Thorp with Bees of California and Norm Gary with Honey Bee Hobbyist. Retired professor Norm Gary happened to stop by the day the author was visiting. He continues with his music, playing with several groups. He is here with Elina Niño the new extension bee specialist at Davis. 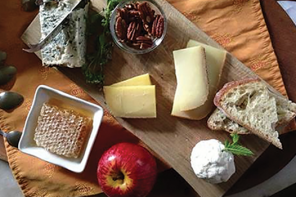 The University of California, Department of Entomology at Davis, has a new entomologist on staff covering extension and research in apiculture. In February I had an opportunity to visit the Harry Laidlaw Jr. Bee Research Laboratory in Davis and meet Elina L. Niño, her husband, Bernardo Niño, and others at the lab. There have not been many changes to the building, although the primary classroom and some technical rooms have been renovated. is retired but continues to be very active in his work, having just co-authored a book with Gordon W. Frankie on the California Bees and Blooms: A Guide for Gardeners and Naturalists. will be able to get to know you better and see how they might support your various programs. Let me start with some personal history. Where were your born? Where did you grow up? How did you become interested in science and more specifically in biology? Elina: If you are a California beekeeper you most likely heard me say that I was born in Bosnia and Herzegovina, the capital city of Sarajevo to be exact. My parents still live in Bosnia and I hope to visit them again soon. Seventeen years ago I came to the U.S. to visit my aunt and uncle in New York for the Summer. At the end of the Summer they generously offered to support my college education so I stayed. I’m very grateful to them, as well as my parents for not flying over to drag me back home as I remained in the U.S. for 14 years before going back for a visit. 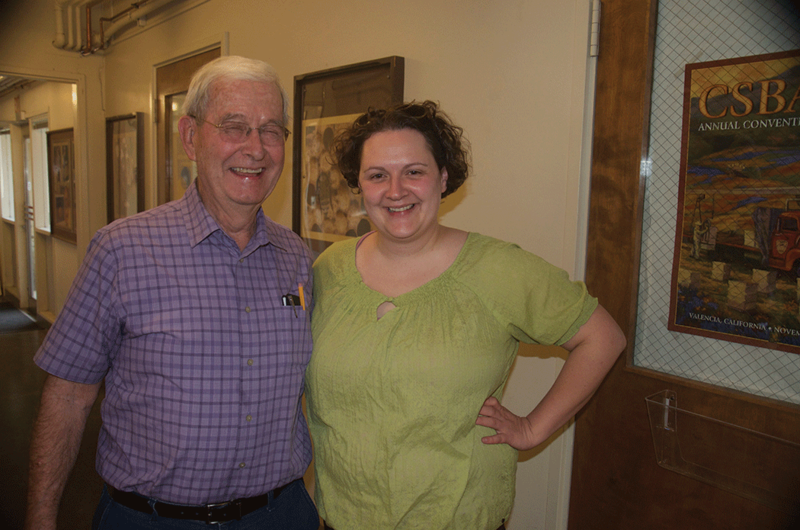 Elina: First off, I have to say I have been extremely lucky to have the most wonderful advisor for my Master’s program. Dr. Wes Watson and a super supportive research specialist Steve Denning. The main question of my master’s thesis was whether if the growth regulator methoprene used for control of pestiferous flies has a negative effect on dung beetle populations on dairy farms. Dung beetles are beneficial insects and are an important member of a healthy ecosystem. They use manure to feed and to reproduce and thereby they compete for resources with filth flies on cattle leading to their control. Basically, they’re the good guys and girls and we wanted to make sure they could be used as a part of a successful integrated pest management program without compromising their survival and health. And we found that indeed, in doses normally used for control of pest flies, methoprene was not harmful to many dung beetle species found on the North Carolina dairy farms. Larry: How did that lead to a Ph.D. at Penn. State University? What was your thesis topic? Explain what you learned in this research. Elina: I actually started my Ph.D. in North Carolina in the Lab of Dr. Christina Grozinger and was co-advised by Dr. David Tarpy. It seemed like a natural transition since I’ve already been working on beneficial insects, and as we all know, honey bees are fascinating and we are not even close to being done with learning about them. In my dissertation work I characterized how drone seminal contributions modulate post-mating changes in queens. My studies revealed a complex interplay of seminal fluid volume and seminal fluid components in triggering and maintaining queen post-mating changes including ovary activation, transcriptional changes in fat body tissue (the site of synthesis of the egg-yolk protein vitellogenin as well as many antimicrobial peptides) and pheromone production. I have since expanded on these findings and the ultimate goal is to identify specific seminal fluid components that are regulating specific post-mating changes. 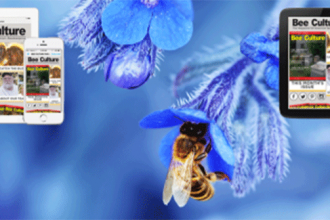 Understanding these complex processes will help us support the honey bee breeding efforts. Larry: You met your husband, Bernardo, at NCSU, and you now share a passion for honey bee and pollinator research. What has been the advantage of working with a husband who shares your interests? What story(s) can you share about this? Elina: Bernardo and I have been working together for a long time and long before we started working on bees. People do have an interesting reaction when they hear we work together and you can tell that they’re thinking: “Poor Bernardo and Elina have to work together.” In fact, we’re a great team and we complement each other very well. Plus there is nobody else who is more invested in our success so we really try to support each other the best that we can. We also work well together at home; we both share in the responsibility of raising our two very active boys. Bernardo has been great about me traveling a lot in the evenings for the extension talks and I’m very grateful to have a supportive husband. Larry: California has a long history of honey bee research and extension. What programs have you started that will continue to make a contribution to California beekeepers and beekeepers everywhere? Elina: In the past year and a half my lab has developed and offered several beginner beekeeping courses, as well as advanced classes including the Queen Rearing Techniques Short Course and Basics of Bee Breeding course. 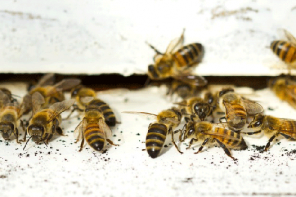 Considering the steady increase in interest in beekeeping, certainly intensified with the invention of the Flow Hive, I think it is crucial to ensure that novice beekeepers understand the issues facing honey bees and are ready to deal with them appropriately. We are also developing a children’s Pollinator Education Program which will take place at our beautiful Häagen-Dazs Honey Bee Haven. I love working with kids and I do think they’re the most awesome audience. We, of course, also have a very active research program. I currently have two Ph.D. students, Cameron Jasper and Patricia Bohls and both are working on furthering our understanding of queen reproductive processes and what factors might be regulating queen health. My lab is also actively working on several applied projects one of which is testing several novel bio pesticides for Varroa mite management. Larry: I know you added a new person in December of last year. Can you tell me about him? Elina: We are very happy to have Charlie Nye join us as our new Staff Research Associate and the Laidlaw facility manager. Charley comes from Illinois where for the past five years he was a technician in the laboratory of Dr. Gene Robinson. He has also assisted with honey bee projects coming from the laboratory of Dr. May Berenbaum. As president of the Central Eastern Illinois Beekeeping Association, he helped in community outreach and was instrumental in creating plantings at the University of Illinois Bee Research Facility supported by a $60,000 grant. Larry: Among other programs, you have announced a California Master Beekeeping program to start in the Fall of 2016. What are the key elements of this program that have been developed? 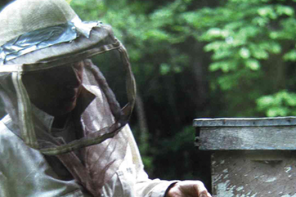 How many beekeepers do you expect to train and certify as master beekeepers during the first five years of the program? Elina: In a sense all of the educational programming that we’ve developed has been in the expectation of offering the California Master Beekeeper Program. We are also developing additional educational resources to be used as part of the program. The program, as is common, will be done in several levels and we would expect to have approximately 50-75 students enrolled in the first year. We are very excited about this program, especially that there will be a large emphasis on educational contributions by participants in their communities. Larry: What is something few beekeepers know about you? Anything in the arts, athletics, or other areas that readers may find interesting? Elina: I’m not very artistic; in fact, I was kicked out of a choir when I was only eleven so you know it’s pretty bad. I was getting into running and even completed a half-marathon, until I injured myself in preparation for an evening race. Then the kids came along and the move to California, well, as you can imagine the running is not very high on my priority list these days. Elina: I can’t believe it has been almost a year and a half since I started as the extension apiculturist at UC Davis. I think it has been great 18 months and I’m very glad I had an opportunity to meet a great deal of beekeepers in the state of California. Ours is a small lab and we hope that we can make valuable contributions to the industry through both our research and extension efforts. 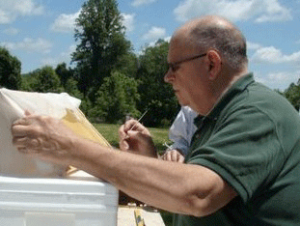 The month of June puts Dr. Connor speaking and vending at the anniversary field day of the Connecticut Beekeepers, a field day at the Eastern Connecticut Beekeepers Association, a Three-Day Queen Rearing Class and a two-day Beekeeping 102 program at Mann Lake in PA, and the weekend Summer meeting of the Virginia State Beekeepers in Smithfield, VA. For details, check the www.wicwas.com or the respective organization’s website.